Drew McQueen Bledsoe (born February 14, 1972) is a retired American football quarterback who played fourteen seasons in the National Football League (NFL). Bledsoe is best known as the starting quarterback for the New England Patriots from 1993 to 2001. He also played for the Buffalo Bills and the Dallas Cowboys. During the 1990s, he was considered the face of the Patriots franchise. The first overall pick in 1993 NFL Draft, Bledsoe helped improve the fortunes of the Patriots, who had fallen on hard times. Under his tenure as starting quarterback, the Patriots ended an eight-season postseason drought, qualified for the playoffs six times, and made one Super Bowl appearance. 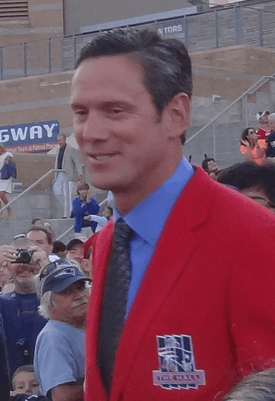 In his second season with the team, he was named to the 1995 Pro Bowl and was the youngest quarterback to appear in the NFL's all-star game at the time. Following a period of declining success and two consecutive seasons where the Patriots missed the playoffs, Bledsoe suffered a near-fatal injury early in the 2001 season and was replaced as starter by Tom Brady. He was unable to regain his starting position after he was medically cleared to play due to Brady's success with the team, which culminated with the franchise's first Super Bowl win. Bledsoe then retired after short stints with the Bills and the Cowboys. For his accomplishments in New England, he was inducted into the Patriots Hall of Fame in 2011. On November 13, 1994, the Patriots had won just three of their first nine games and were losing, 20–3, to the Minnesota Vikings at halftime. Bledsoe led a comeback victory in which the Patriots won, 26–20, in overtime, as he set single game records in pass completions (45) and attempts (70). By remaining undefeated throughout the succeeding games, the Patriots earned their first postseason appearance in eight years. Bledsoe started all 16 games that season and went on to set an NFL record in pass attempts (691), becoming the second NFL quarterback to complete 400 or more passes in a season (400), and led the league in passing yards (4,555). Due to his performance, Bledsoe was selected to his first Pro Bowl as an alternate. In March 2001, Bledsoe was signed to a then-record ten-year, $103 million contract. Bledsoe did not finish his career with the Patriots, nor see the opening of the new Gillette Stadium. During the second game of the 2001 season, Bledsoe was hit by New York Jets linebacker Mo Lewis and suffered a sheared blood vessel in his chest - which almost resulted in his death. 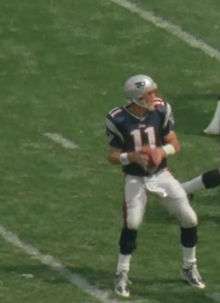 Replacing Bledsoe at quarterback, soon-to-be All-Pro quarterback Tom Brady led the Patriots to a Super Bowl championship. Though he never regained his starting role, Bledsoe proved integral to his team's playoff run when he replaced a hobbled Brady in the AFC Championship Game against Pittsburgh. Bledsoe, starting from the Steelers 40-yard line, capped a scoring drive with an 11-yard touchdown pass to David Patten to seal a 24–17 victory. In winning the conference championship game, Bledsoe completed 10 of 21 passes for 102 yards and a touchdown, with no interceptions. It was the second time in six years (1996 and 2001) that Bledsoe was an integral part in leading the Patriots to a Super Bowl appearance. Bledsoe went on to sign with the Dallas Cowboys, where he was reunited with former coach Bill Parcells. Bledsoe was intended to be a long-term solution at quarterback for the Cowboys. Said Bledsoe on the day he signed with Dallas, "Bill [Parcells] wants me here, and being the starter. I anticipate that being the case and not for one year." He signed for $23 million for three years. However, in 2006, his final season with the Cowboys, Bledsoe's play became erratic, so much so that six games into the season he was replaced by then-backup and soon to be Pro-Bowler Tony Romo. Shortly after the end of the 2006 season, Bledsoe was released by the Cowboys. Unwilling to be relegated to a backup position, Bledsoe announced his retirement from the NFL on April 11, 2007. Bledsoe's parents were school teachers in Ellensburg, Washington. From his earliest years he was passionate about football. His father was a coach who ran an important football camp in Washington state, and Drew literally toddled under the protective eye of professional players and coaches who helped his father run the camp. Drew and his wife Maura live in Bend, Oregon and have four children: sons Stuart, John, Henry, and daughter Healy. He coaches his sons, Stuart and John, at Summit High School. While playing for the New England Patriots, Drew Bledsoe lived in Bridgewater, Massachusetts on Tabway Lane, and in Medfield, Massachusetts, in the house that is currently owned by retired Major League Baseball player Curt Schilling. Right before his departure from the New England Patriots and the town of Medfield, he donated football cleats to the entire Medfield High School football team. After his retirement in 2007, Bledsoe founded the Doubleback Winery along with close friend Chris Figgins. The company's grapes are harvested from McQueen Vineyards and Flying B Vineyards, located in and around Walla Walla, Washington. The wine has had success recently, placing 53rd overall in Wine Spectator's Top 100 wines. His first vintage which was 2007 vintage quickly sold out of its initial 600 cases. In 2012, Marvin R. Shanken invited Ernie Els, Greg Norman, Tom Seaver and Bledsoe to introduce his wines, despite Shanken's disdain for New England Patriots. Drew is currently the offensive coordinator/quarterbacks coach at Summit High School in Bend, Oregon. Bledsoe ranks fifth all-time in completions (3,839), seventh in passing yards (44,611), and 13th in touchdown passes (251). Bledsoe's career (57.2) completion percentage is lower than all recent Hall of Fame quarterbacks with the exception of John Elway. Bledsoe's NFL career passer rating of (77.1) surpasses nine Hall of Fame Quarterbacks. Bledsoe's 37 regular season 300-yard passing games ranks 9th in league history. He also ranks 6th (with 6) in most career regular season 400-yard passing games by an NFL quarterback. He was selected to the Pro Bowl four times (in 1994, 1996, 1997, 2002). Bledsoe was eligible for the Pro Football Hall of Fame in 2011. ↑ "Bledsoe retires, ends 14-year career". ESPN. 2007-04-12. Retrieved 2010-11-30. 1 2 Collins, Louise Mooney; Speace, Geri J. (1995). Newsmakers, The People Behind Today's Headlines. New York: Gale Research Inc. pp. 32–35. ISBN 0-8103-5745-3. 1 2 No sour grapes from retired Bledsoe Dallas Morning News. October 14, 2007. Retrieved October 12, 2008.